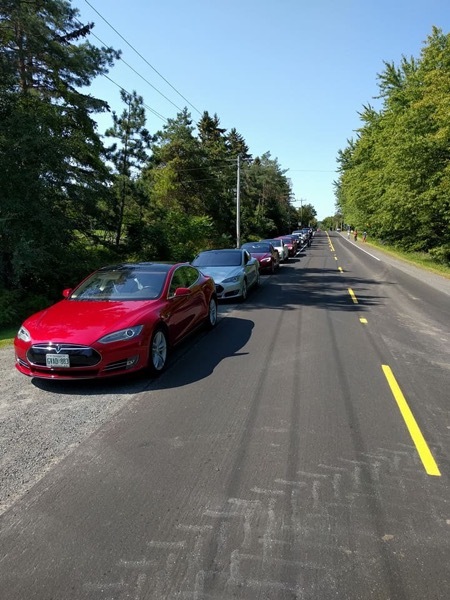 We conducted an electric car rally from Ottawa to Merrickville, a distance of about 60km. We travelled to Merrickville in a convoy along a scenic route. At Merrickville we had lunch together. One additional electric car enthusiast met us in Merrickville after driving up from New York State. While in Merrickville many visitors to the historic town had an opportunity to see many electric cars and ask us about the vehicles. Over lunch together, th discussion centred on electric vehicles and future infrasture issues for electric vehicles. P.S I am chasing someone who took great photos. Check out Tesla Ottawa on Facebook for 4 photos of the event post d by one of the participants. Join Drive Electric Week in Ottawa! Traveling from IKEA Ottawa to the The Yellow Canoe in Merrickville. We will have an Electric Car rally that is open to all electric car enthusiasts that are interested in travelling to Merrickville.